Martin Salvino State Farm Agency is a good neighbor to his local charity Park Lawn by donating $2 per new follower on his Facebook page. This will fund additional art classes for those with special needs. Aug. 21, 2012 - PRLog -- Martin Salvino State Farm Agency of Alsip has pledged to donate $2 for every person who likes his Facebook page in August and September to provide additional art classes for those with special needs at his neighborhood nonprofit Park Lawn. The art class is part of McCord Gallery and Cultural Center’s new outreach program. Park Lawn began working with McCord in June 2012 with group of individuals with developmental disabilities attending McCord’s facility. Anyone with a Facebook account should hit the like button on Martin Salvino Sate Farm Agency at www.facebook.com/salvinostatefarm in order to qualify for the $2 towards Park Lawn. 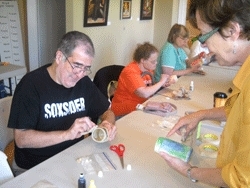 The art professionals at McCord Gallery and Cultural Center will teach this class to a group of Park Lawn participants providing a form of expression and communication to individuals with developmental disabilities. It will also provide more comfort for Park Lawn’s participants being a familiar environment. Salvino State Farm is located across the street from Park Lawn’s workshop in Oak Lawn. Martin Salvino State Farm Agency mission is to help people manage the risks of everyday life, recover from the unexpected and realize their dreams. While State Farm and its affiliates are the largest provider of car insurance in the U.S. and is a leading insurer in Canada, they are always local. In addition to providing auto insurance quotes, their 17,800 agents and more than 65,000 employees serve 81 million policies and accounts – more than 79 million auto, home, life and health policies in the United States and Canada, and nearly 2 million bank accounts. Commercial auto insurance, along with coverage for renters, business owners, boats and motorcycles, is also available. More information can be found at www.martinsalvino.com. The McCord Gallery & Cultural Center was formed through the interests and hard work of the local community. A passionate group of volunteers assembled by the Village of Palos Park determined the fate of the McCord House…to be an arts center. It was incorporated with 501(c) 3 status in February 2003 and more information is available at www.mccordgallery.org. Park Lawn is a non-profit organization offering a variety of programs and services such as adult developmental training, residential facilities, vocational training, supported employment and more for individuals with developmental disabilities since 1955. The mission of Park Lawn is to provide services that promote independence, choice and access to community for people with developmental disabilities. More information about Park Lawn can be found at www.parklawn.com.